I love this recipe as it's easy, tasty and very good for you with all it's anti-inflammatory ingredients. 2 small or one very large sweet potatoes, sliced thin. 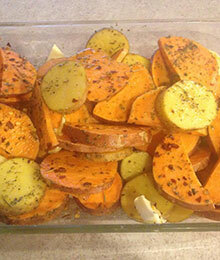 Optional: 2 small white potatoes, sliced a bit thicker than the sweet potatoes as they cook a little faster. 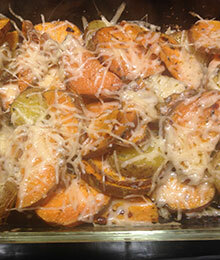 Put all ingredients (except cheese) in a large glass baking dish. The potatoes should be no more than 2-3 layers thick or they don't cook properly. Mix well to distribute oil and seasonings. Bake at 375 for an hour. When potatoes are soft (poke with a fork or knife), remove and sprinkle the parmesan cheese evenly over the top. Return to oven for another 5-10 minutes.